Inokuchi defined a fracture of the talar neck as one in which the main fracture line exited the inferior cortex of the talus anterior to the posterior subtalar facet. Nevertheless, some fractures have both neck and body components. Fractures of the neck are about twice as common as fractures of the body. Most are caused by high-energy injuries. One third have malleolar fractures, and fractures of the tibia, calcaneum, midfoot and forefoot are common. Canale added a fourth group with subluxation/dislocation of the ankle, subtalar and talonavicular joints. 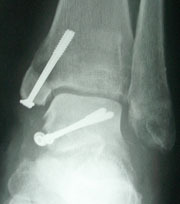 Higher grade fractures are more commonly open, occasionally with total extrusion of the talar body, and have a higher incidence of avascular necrosis (and possibly compartment syndrome and nerve injuries). There is an AO universal classification which is rarely used. Patients usually present with a high-energy injury to the foot and ankle, often with other injuries. The injury may be open. The patient should be assessed for nerve and vascular injuries and compartment syndrome. A few patients present with a lower-energy injury and may be suspected of having a ligament injury or malleolar fracture – indeed, the diagnosis is occasionally delayed until a presumed ligament injury fails to settle and imaging is obtained. Clinical assessment of the whole patient is essential. Plain AP and lateral radiographs will usually make the diagnosis; in the presence of major derangement they may be difficult to interpret. A CT is often useful to assess the extent and severity of the injury, aid the decision on whether to offer surgery and inform the operative plan. We would be reluctant to operate for a talar fracture without a CT, except in emergency. A difficult delayed diagnosis may be helped by isotope scanning and/or MR – both will also give additional information about vascularity. After fixation, CT can be useful to assess reduction and union, and isotope scanning or MR vascularity or infection, provided (in the case of CT and MR) that non-ferromagnetic implants have been used. Initial resuscitation, pain relief, treatment of open wounds and temporary splintage are generally applicable to all serious injuries. Undisplaced fractures are often treated in casts in neutral or plantarflexion with non-weightbearing till radiographic fracture union. Surgical fixation has been suggested to allow early movement, if not weightbearing. No comparative studies have been reported. there is also a suggestion that reduction and stable fixation may reduce the risk of AVN, although this has not been demonstrated in all studies. Temporary closed reduction and splintage may allow the tissues to recover and allow ORIF, but few modern series have reported the results of closed reduction and casting as definitive treatemnt; open surgery seems unlikely to be challenged as standard of care. An anteromedial approach is most commonly used; an anterolateral approach gives access to what is usually the less comminuted side of the fracture. Recent series have used a combination of anteromedial and anterolateral approaches with improved access but no increase in AVN. Biomechanical studies suggest that posterior to anterior screw insertion gives best compression; indeed, this was the only configuration that had enough shear strength to resist physiological loading. However, posterior screw insertion with anterior fracture exposure is awkward with the risk of nerve injury. 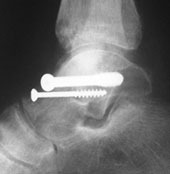 Therefore, screw insertion through an anterior approach is common. Recent studies have suggested the use of mini-fragment plates to bridge comminution and reduce the risk of varus malunion. Post-operatively, fractures are initially splinted for a variable time before movement is permitted; most modern series seem to have permitted movement within a few weeks of surgery. No biomechanical or comparative clinical evidence is available to tell how long movement should be delayed, if at all. Weightbearing is usually not permitted until the fracture is radiologically united, usually at 2-3 months. Fractures of the talus are serious injuries. Most patients have some degree of long-term reduction of foot and ankle function. Both Vallier and Sanders found that about 70% returned to their previous work, some times with some modification. Overall function is most accurately predicted by the severity of the initial injury, with open, comminuted fractures of high Hawkins-Canale grade doing worse even with good treatment. Residual varus also predicted a poor result in one series. Osteoarthritis of the ankle and subtalar joint is common after displaced fractures. Elgafy considered it contributed more to the outcome than osteonecrosis, but most other authors both factors are of considerable significance. While patients with OA have, on average, poorer functional outcome than those without, some of this is predicted by original injury severity and some patients with severe arthritis have few symptoms. OA can usually be salvaged successfully by fusion or ankle replacement, but in the presence of abnormal bone anatomy and vascularity and compromised soft tissues, the patient must be aware of the risks of failure (though the available data do not allow accurate estimation of any increased risk). The vascular anatomy of the talus means that fractures may cause avascular necrosis. Most series report that the rate of AVN increases with increased Hawkins-Canale grade, and probably also with communition and open fractures. There is a controversy over whether surgical fixation of talar fractures decreases the AVN risk; this is conducted indirectly on data which could have been affected by other factors and small numbers, as there are no RCTs. The risk of AVN in displaced fractures is about 30-60%, with up to 100% in grade IV injuries, but it may occur in up to 10% of apparently undisplaced fractures. AVN is often partial and leads to talar collapse and OA in perhaps half of the patients in whom it occurs – this information is not reported in many studies. The classical radiological sign of AVN is the Hawkins sign, a subchondral radiolucency in the talar dome. This is interpreted as indicating vascularity and a good outcome. Lindvall reported the sensitivity of the Hawkins sign (for predicting the ultimate development of AVN) as 67% and the specificity as 86%, and Tezval (2007) 100% and 58%, although it is not clear what the criteria for the diagnosis of AVN were. MR gives a good assessment of AVN, but can overestimate the extent due to oedema. Traditionally, AVN has been managed by prolonged non-weightbearing in casts or braces, but there is no evidence that this reduces the rate of talar collapse or OA. Some patients will develop end-stage symptomatic OA requiring fusion, sometimes with major bone-grafting; AVN is usually a contra-indication to ankle replacement.